With Doubleknot’s integrated online and on-site ticketing software and admissions solutions, you can sell and issue scannable tickets for general admissions, tours, field trips, events, programs and facility rentals. Quick and easy online ticket sales and mobile tickets. The group ticketing option reduces wait time by checking in all members of a group in a single scan. 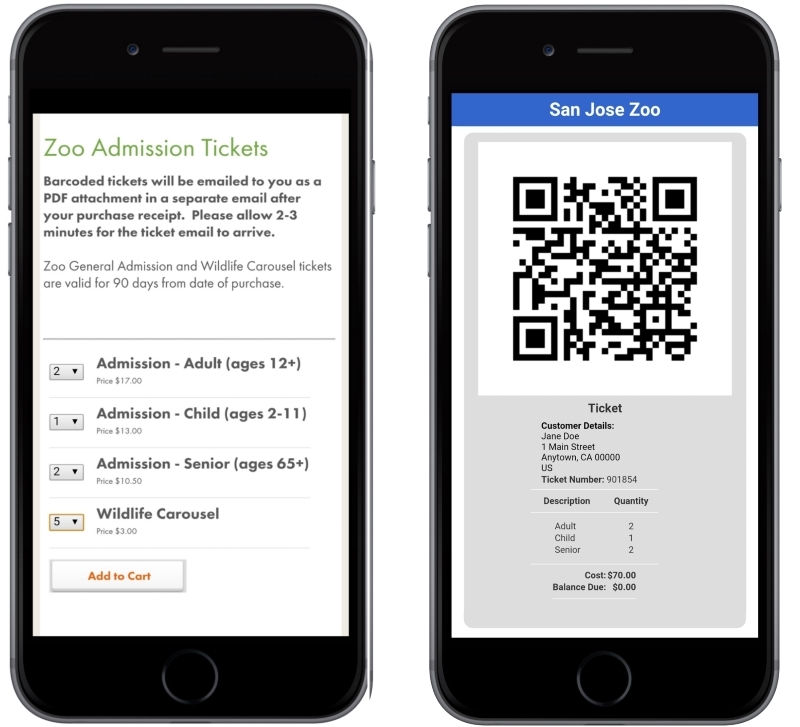 Customers can purchase tickets online to print at home or display on a smartphone. On site, you can sell and print tickets at the front desk or front gate with the Sales Station POS, and when ticket lines are long, you can use the Sales Station mobile POS as an ad-hoc ticket booth for linebustingand deliver tickets by text message or email. It used to take 90 minutes to check in 600 teachers for Education Day. With Doubleknot, we did it in 25. Issue printed, print-at-home and mobile tickets for admissions, events, camps, classes, field trips, group tours, add-on experiences and more. Eliminate long lines by setting up ad hoc ticketing with the Sales Station mobile POS. Speed admissions and check-in with group ticketing, and quickly update reservation and payment records to reflect the actual number of attendees. Identify visitors with a balance due and collect outstanding payments before validating tickets. Customize tickets with your logos, graphics and instructions. Apply discounts based on membership level or targeted promotions. Check in visitors with scanners, web cameras and iOS devices. Identify new opportunities by applying analytics to ticket purchases and utilization. solutions for ticketing and admissions. Reminders: Schedule and send email reminders to ticket holders with access to tickets. Attendance Record: Record attendance or facility use with a date/time stamp. Admissions Management and Ticket Validation: Scanning a ticket shows whether the ticket is valid or has already been used, if money is due and if the ticket has been presented within the allowable admission time. Timed Entry Tickets and Capacity Management: Timed tickets for tours and special exhibits reduce lines and crowding, improve security and increase visitor satisfaction. Capacity management can be applied to overall attendance as well as to different ticket and attendee types to ensure that admissions are never oversold. Ticket Customization: Customize tickets with your own logos, graphics and instructions. Mobile Check In: Issue QR codes on receipts and tickets that can be scanned with our app for iOS devices including iPhones and iPads. Computer Check In: Check-in participants using a camera connected to any Windows computer.